KeepVid, one of the most popular YouTube downloaders around, is no more. The site itself is still up and running, but instead of giving you the ability to download YouTube videos, the homepage is full of advice for staying on the right side of the law How Your Amazon Fire TV Stick and Kodi Could Cause Legal Issues How Your Amazon Fire TV Stick and Kodi Could Cause Legal Issues Kodi and the Amazon Fire TV Stick are insanely popular. However, although users are attracted to both Kodi and the Amazon Fire TV Stick's flexibility, they could easily land themselves in legal hot water. Read More at all times. People have been downloading videos off YouTube and other sites since forever. It’s an easy way of obtaining a video to keep, or even just the audio for obvious reasons. However, it’s not only against YouTube’s Terms of Service, it’s also usually illegal. As first noted by TorrentFreak, KeepVid no longer lets you keep videos. Which was its whole reason for being. Instead, the site exists to educate and inform visitors about how downloading videos from popular sites is against their Terms of Service. The KeepVid homepage formerly let you download videos from YouTube, Vimeo, Facebook, and more by pasting in a URL. Now, the homepage is full of statistics about online video, and an explanation as to why downloading copyrighted videos is bad. The people behind KeepVid haven’t explained why the site has morphed from a video downloader to an educational resource. However, they have confirmed that both KeepVid and KeepVid Pro are no longer working and how that’s unlikely to change. 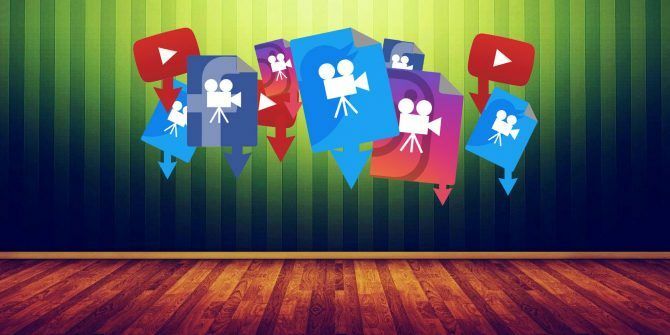 In a statement to BBC News, the administrators of KeepVid said, “Video downloading will become possible if the video download tools and video sharing platforms reach an agreement about downloading videos”. Which isn’t going to happen anytime soon. Unless this is some kind of fake out for publicity it seems pretty clear what’s happened. To switch from offering the means to download videos to advice on avoiding doing so suggests pressure has been applied on KeepVid. And it’s clearly worked too. The thing to remember is that downloading videos you don’t have permission to download clearly is against the law. And that’s why the RIAA shut down YouTube-MP3 RIAA Finally Shuts Down Popular YouTube to MP3 Converter RIAA Finally Shuts Down Popular YouTube to MP3 Converter The RIAA has finally succeeded in closing down the massively popular video-audio conversion site YouTube-MP3. Here's what happened. Read More last year, and why KeepVid has now stopped functioning. Explore more about: Copyright, Online Video, YouTube. Real f***ing bummer. I had just purchased the full version and the refund period had just passed when they updated it to be no longer able to download videos. I feel like I got scammed. Christ, I'm having Betamax flashbacks. As with anything software related, there is always a workaround. The Youtube restriction is only in the latest version, 7.3.0. Any version earlier than that will still download Youtube videos. The trick: don't update! I'm on version, 7.1.2 and will stay right there. Lol more like Keepvid (dot) site now. Pls. Frankly speaking, besides those copyright-protected videos, there are still lots of videos resources which are free to be kept by all users. As for me, I would like to keep the videos of my idol's concert instead of saving tons of photos on my phone. The fans who took these videos and posted online mostly would add watermarks to them. They also stated that it's OK for keeping or even re-posting them without removing the watermarks originally added on the videos. So I think that it is reasonable to save online videos sometime. So are the videos uploaded to Youtube website belong to Youtube company? There are some copy-righted, company-owned materials on Youtube but what about millions of videos uploaded by individuals/non-profit organizations to help, educate and entertain others? My reasons for watching Youtube are diy projects, computing, sportive excercises etc. In order to save bandwitdth why we cannot download the content? Most important point is "Why Youtube doesn't ask uploaders if they allow visitors to download videos for offline watching?" Invidiuals may accept this because they are people like us. We don't need big entertainment companies do the same, I don't need anything from them but individuals/non-profit organizations. This is why we humanity need Blockchain Technology in every computing area to replace big corporations services like Google and others. It's for sure not a right thing to download videos from any source, including YouTube. However, downloading videos is still a great demand. That's why people are still looking for ways to download stuff. I'm an educator in Los Angele. To be honest, I've been using YouTube videos as teaching materials but I never use it with any commercial intent. Since KeepVid shut down its service, I have to find alternatives. If anyone has such a need like me, try vidpaw. Though I just used it yesterday, it makes me feel it's KeepVid alive. Is vidpaw.com free to use? Cuz I just bought KeepVid Pro weeks ago and now the company is out of business. I don't want to pay for another so-called downloader again. There's a functioning archive of the old site at http://keepvid.site - it's loaded with PUA, but it works.